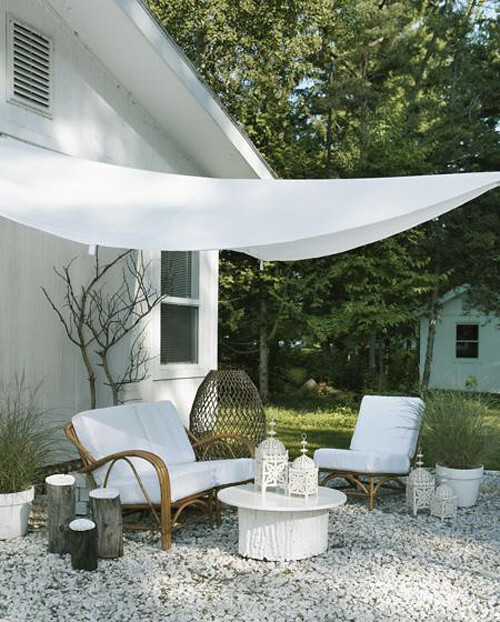 Remember this summer cottage decorated in white and rattan? There are some more photos of this cute little house to be found on the website of Maison & Demeure. The gravel terrace (image above) is protected from the sun by simple white curtains. A tree log, painted with white lacquer, functions as a table. The cabin is decorated with items from stores such as IKEA and beautiful objects found in designer shops and flea markets. The folding table, lanterns and straw cushions add to the tropical feel of the space. I’m loving Moroccan-style lanterns lately, they’re just so fabulous.